According to the results of the 2018 Artificial Intelligence and Digital Talent Compensation Survey, only 7% of organizations globally believe their HR function is fully prepared for the organizational changes required for digital transformation, while 13% of organizations feel completely unprepared. In order to be prepared, organizations need to understand how to attract and retain digital talent, the best way to get work done, and how to differentiate and modernize their compensation and rewards strategies. The 2018 Artificial Intelligence and Digital Talent Compensation Survey found that nine out of 10 organizations globally are facing issues with attracting and retaining digital talent. ‘Digital talent’ is not just a narrow set of technology or application development jobs, but any worker with the skills (e.g., artificial intelligence, big data, digital strategy, digital marketing) needed to support the digital transformation of an organization. Without digital talent, an organization will struggle to successfully transform their business, especially if the HR teams aren’t on top of the issues (or don’t have enough data). 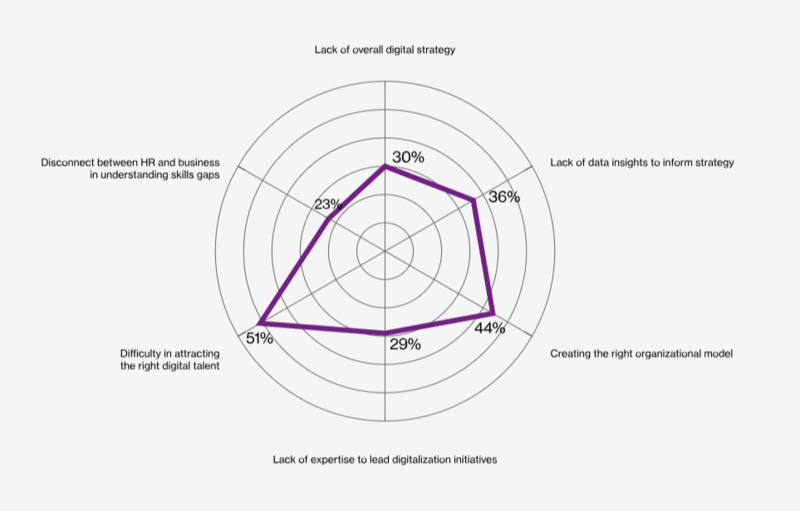 According to the research, the three top challenges for digital transformation are difficulty in attracting the right digital talent, creating the right organizational model and lack of data insights to inform strategy (see Figure below). Another key issue for organizations is the use of non-traditional work sources to fill critical skill gaps; today the most popular alternative work sources are free agents (71%), followed by automation (36%). Workplace automation is anything that uses technology to complete tasks either to augment or replace human activities. So, how will those companies that plan to automate certain work process attract and retain the talent they need to support this? For attracting digital talent most organizations in the survey identified cash compensation as an effective tool, followed by: providing interesting, challenging and varied work, and flexible working. However, when it comes to retention, cash compensation slips down to the fifth spot. Instead, the top three factors are providing interesting, challenging work; flexible working arrangements; and clear paths for growth and promotion. With the current scarcity of digital skills, the rising demand for talent, and the prevalence in the digital workforce of digital natives who grew up with new technology, digital roles and skills are likely to require a different approach in terms of compensation and rewards strategy. Differentiation and segmentation are going to be key – 53% of organizations differentiate their reward programs for their digital talent. Yet organizations should not consider their digital talent in isolation from their wider HR strategies. The challenges around digital talent are part of the wider picture of rewards – where major, rapid cultural and technological changes are causing workforce expectations to evolve, and driving businesses to modernize their total rewards strategies, as we’ve shown in our wider 2018 Modernizing Total Rewards Survey. Getting its total rewards strategy right is critical to an organization’s ability to compete for talent and to deliver the best financial return. The First Industrial Revolution may have taken around 60-80 years, whereas many organizations will have just a handful of years to navigate the Fourth Industrial Revolution. The 2018 Artificial Intelligence and Digital Talent Compensation Survey is an invaluable guide to what this involves – how to understand the digital workforce and successfully manage the HR transformation. This blog was originally published on the Willis Towers Watson Wire, January 11, 2019. 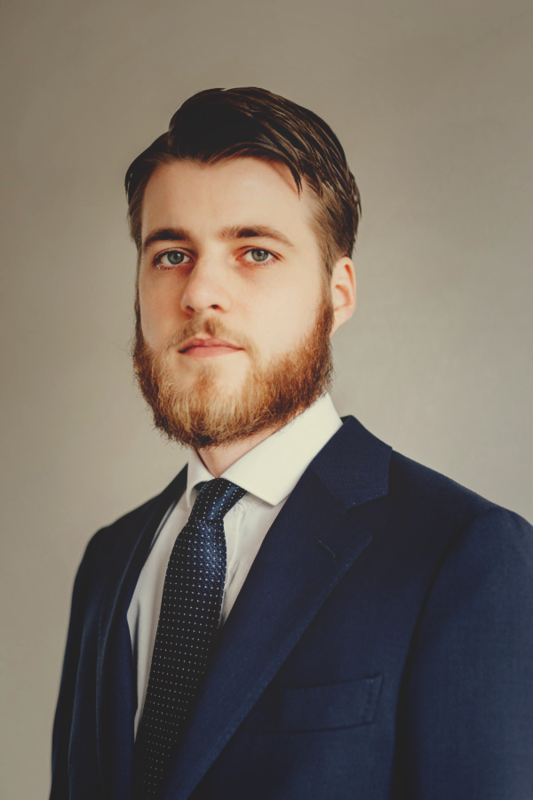 Michiel is a Rewards Consultant within the Talent & Rewards line of business of Willis Towers Watson. Michiel has a strong focus on the digital and technology industry and is leading the global Artificial Intelligence and Digital Talent survey offering.